SPP measurements have proved useful in the assessment of peripheral arterial disease (PAD) for both critical limb ischaemia (CLI), and also for the determination of optimal levels for amputation. There are also indications in the literature that SPP measurements are useful indicators for wound healing potential, and more recently for the investigation of ischaemia over the ischial tuberosity in people with spinal cord injury. SPP provides a good indication of the status of the proximal arterial system whilst remaining unaffected by conditions such as arterial wall calcification (commonly seen in diabetic patients with PAD for example). Foot SPP has also been shown to correlate well to toe pressure and would be useful in situations where toe blood pressure measurements are not possible, due to toe amputation, ulceration or gangrene. 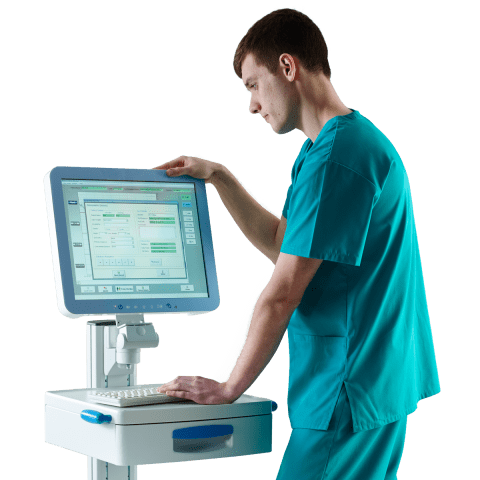 The moorVMS-VASC system, including the laser Doppler monitor moorVMS-LDF, pressure cuff controller moorVMS-PRES and low profile fibre optic probe (VP-SPP) have been specifically designed to aid micro vascular assessments in a variety of physiological research and clinical applications. The user friendly software can be used for single tests or any combination of tests according to your study requirements. This multi-functional system is easily configured enabling you to save user selected and defined test sequences or alternatively perform single tests of your choice. A range of tests are available and the software makes these simple to set-up, customise and perform. Skin perfusion pressure measurement is valuable in the diagnosis of critical limb ischemia. Journal of Vascular Surgery, 26(4), pp 629-637. Effect of Durations of Wheelchair Tilt-in-Space and Recline on Skin Perfusion Over the Ischial Tuberosity in People with Spinal Cord Injury. Archives of Physical Medicine and Rehabilitation, 94(4), pp 667-672. Skin perfusion pressure of the foot is a good substitute for toe pressure in the assessment of limb ischemia. Journal of Vascular Surgery, 32(1), pp 32-36. Importance of skin perfusion pressure in treatment of critical limb ischemia. Wound Research, Apr 2008 Issue 4. Predictive value of skin perfusion pressure after endovascular therapy for wound heal of critical limb ischemia. Journal of the American College of Cardiology, Volume 61, Issue 10, Supplement 12 March 2013, pp E1805. Clinical reliability and utility of skin perfusion pressure measurement in ischemic limbs – Comparison with other non-invasive diagnostic methods. Journal of Vascular Surgery, 47(2), pp 318-323.